by Joyce of Pinaymama. Thanks, Joyce. 1. Take a Photo or install one now . 2. Do not change clothes,do not trim the hair,the main image is to be captured (we want to see the real you...he..he..) . 4. Post this instructions (required). 5. Tag people to show appreciation to them that touch your heart because of their friendly attitude (required). This is probably my most recent picture. This was taken with my laptop's camera. It was taken at night right after my shower, before the little one's bedtime. She likes to make faces and seeing them on the computer screen...not very flattering, is it? gosh! dalagita na rin pala si daughter mo. as with Ethan having a crush... wala pa yata pero sabi nya two of his classmates love him...i did not qualify the "love" meaning. let his mommy deal with that. finish contract na ko dun. LOL! That's funny mommy! Loved it! Anyway, ur daughter is so gwapa! Thanks for posting the tag mommy!!! Too funny! LOL! Even so, ganda nyo pa rin! Those are the fun moments that kids love to have with mom or dad! Ang saya !Cute nyo! was just too tired yesterday, having gone to my oncologist, and it was almost like a whole day affair. thank God clear naman lahat, para akong nakahinga ng maluwag. balik ulit in 6 months. hope all's well. you too had to go to your doctor? wow, erica is fast becoming a pretty young lady! you look like you lost weight. are you on a diet? Gee, dalaginding na pala anak mo. Parang kailan lang ano?. 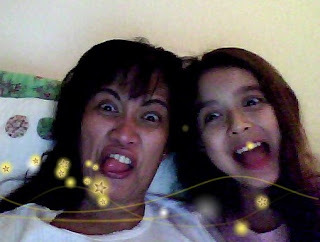 We often do funny and silly faces too. I don't know but kids love it, ha,ha.